As the rainy season eases in the metro to neutralize the summer heat, it becomes the ideal time of year to stay indoors and bond with family and loved ones in the comforts of home. Making a perfect setting for your home staycation is the cool and comfortable ambiance made possible by your air-conditioner unit. But if you are not getting the best of home cooling yet, consider upgrading to LG’s residential air conditioners. LG Single Split Inverter’s energy-saving technology lets you enjoy a cool home ambiance throughout the day and night without worrying about racking up your electricity bill. Its innovative airflow design makes it the world’s quietest, coolest, most pleasant and comfortable indoor air conditioning solution. Stylishly designed, LG split type air conditioners boast of innovative features like Mosquito Away, Active Energy Control and allergy reduction filters. 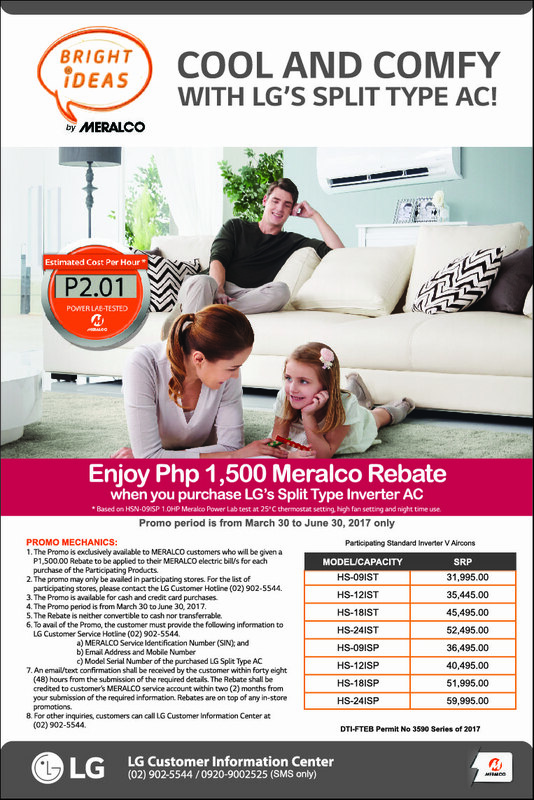 In partnership with Meralco’s ‘Bright Ideas’ Program, a customer information drive empowering residential customers in managing their electricity consumption and realizing an improved lifestyle, LG is offering a Php 1,500 rebate to those who avail of LG’s Standard Inverter and Premium Inverter aircon models at LG concept stores and participating dealers from March 30 to June 30, 2017. Exclusive to Meralco customers, the rebate will be applied to the customers’ MERALCO electricity bill for each purchase of the participating products. The promo is available for cash and credit card purchases. LG Electronics Philippines Managing Director Inkwun Heo said that the promo is one of the company’s ways of thanking its customers. “LG has been creating technology to make life good. In our 70th year, we want to thank our customers once more by offering a rebate for each purchase of selected models of our Inverter aircon,” he said.